TechnoTan offers a complete range of Tan Care products, each beautifully designed to prepare your skin for tanning and extending the life of your tan. Giving you a professional finish, at the comfort of your own home. Our products are made with love and enriched with ingredients to nourish and enhance your skin. No matter your age, size or skin type, our products are aimed at making you feel like a bronzed goddess. 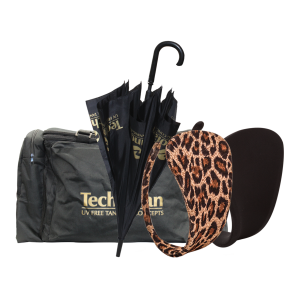 TechnoTan offers a complete range of Tan Care products, designed to prepare your skin for the tan or to extend the life of your tan. We also carry products to enhance your tan from exfoliating mitts, to bronzing creams and tanning mousse. We offer a full range of tanning accessories to enhance your tan. TechnoTan has met the demand for a mineral cosmetic range by introducing Mosaic Minerals. These products can be used to compliment a spray tan and provide a regular day to day natural finish. As skin is the largest organ of the human body, we value it’s importance; offering products that work with the skin, rather than against it. We believe by doing this, it creates a more natural, flawless look. The beautiful scents of Tanbience Melts transform salons, home studios and living rooms into tranquil getaways. 100% Australian handmade, Tanbience Melts are created with care from organic soy wax. All Tanbience products are completely vegan, non-toxic, kosher, lead and animal free.